Welcome Debbie Orre to the NNNO Board of Directors ! Until her recent retirement, Debbie Orre MSN, RN practiced nursing at her local community hospital for over thirty years. During the last nine years of her career, Debbie served as the Dean of Nursing Education at Holyoke Community College (MA) and Dean of the Department of Health Science at Mt. Wachusett Community College (MA). During her tenure at the latter, Debbie oversaw a budget of nearly one million dollars and was responsible for three program accreditations as well as overseeing the development of multiple new courses. Debbie has published many articles including an editorial in the November 2006 issue of the American Journal of Nursing, "LPNs and the Nursing Shortage". Debbie is currently pursuing her doctoral degree at the University of Massachusetts: Amherst. The topic of her dissertation is Community College Nursing Programs and the Spirit of Inclusion. Volunteerism is a mainstay of Debbie's practice. She has traveled twice to Haiti since this country's devastating earthquake and helped to treat many injured Haitians. Debbie is a long time board member of the Gardner Visiting Nurses Association and presently serves as the President. Debbie has been committed to seeing a National Nurse for health promotion and prevention since the idea was first introduced to the nation in 2005. 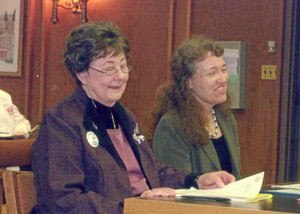 She helped to organize a statewide conference at Mt Wachusett Community College in 2006 that featured keynote speakers from the National Nursing Network Organization. As a result her nursing students pursued and were successful in seeing the passage of a resolution in the Massachusetts General Court, the state legislative body of Massachusetts, urging the US Congress to enact legislation to create a National Nurse position in 2008. How Would a National Nurse Could Help Promote Prevention? The NNNO Board of Directors frequently receives email requests to post information on the National Nurse Newslink. Many individuals have a vision for how HR 4601 The National Nurse Act of 2010 could be implemented, such as partnering with existing agencies that already have information ready to be disseminated and strengthening the relationship between government agencies and health-related national organizations. Recently, Joe Lederman from Drugwatch.com wrote us the following. It is a good example of the kind of key information a National Nurse could disburse as appropriate. "Global health issues arise from a number of issues; poverty and poor health systems as contributing factors. Many people would also name drug abuse as a contributing factor to the unhealthy world we live in. A less understood issue arising from poor health systems is that our use, or rather abuse, of prescription drugs has the potential for more harm than good. Thankfully, there are resources available to us as consumers to know what to watch for and how to improve our use of drugs. Drugwatch.com is a comprehensive web site featuring extensive information about medications, drug interactions, and drug side effects to aid in the protection of patients and consumers. By providing FDA alerts, drug interactions, and potential side effects on the site, patients have access to valuable knowledge that could enhance their ability to voice concerns with their doctor and improve their quality of care. To avoid adverse reactions and serious side effects, patients should understand which additional drugs may affect their medication and should speak with a doctor about interactions and potential side effects associated with the use of a combination of medications. Side effects may occur following the use of certain drugs, as patients respond differently to medications depending on a variety of factors including age, overall health, gender, ethnicity, and the levels of severity of the illness or disease the patient is fighting. Side effects may also occur as a result of taking a certain medication in combination with another drug or substance, whether it is a prescription medication, over-the-counter drug, herbal supplement, or food or drink. Beginning treatment with a new medication, ceasing treatment, or adjusting a patient's dosage may also cause a patient to experience unwanted reactions to medications. By providing alerts, drug information and side effects about prescription and over the counter medications, we can ensure an environment where patients, nurses and physicians have the best knowledge on their medical treatment plans and health." In this day and age, many people still feel nurses are trustworthy people. A person with an official "National Nurse" title would be a huge asset to society. People will be more apt to listen to medical advice. If this person were to advocate for an offical drugwatch website, the incidents related to drug interactions consequences would decrease sharply. On both the patient's side as well as the medical provider's side. I have searched this site on many occassions using it as a quick refrence tool. It is a very educational, easy to understand website. Student Support for Legislation for National Nurse Act Abounds! There is no shortage of enthusiasm and approval for a National Nurse among the nation's graduate and undergraduate nursing students. The NNNO Board of Directors continues to receive email and phone calls from those who are studying HR 4601 The National Nurse Act of 2010. In the first three days of October alone, the Board noted that the National Nurse website was linked to nursing programs at universities in California, Colorado, Florida, Illinois, Maryland, Michigan, Minnesota, Missouri, New Jersey, North Carolina, Ohio, Pennsylvania, South Carolina, Tennessee, Texas, Washington and Wisconsin! Interested parties are encouraged to sign up for the National Nurse newsletter and also to contact the NNNO Board for resources and information that may assist them in their studies. We are always happy to answer questions that any of you have about the current legislation and where we are headed. All healthcare providers agree that there is a "national need for an increased emphasis on strategies to increase health promotion and disease prevention efforts in this country." As societies change and many people are without healthcare, we have a duty to inform the public on ways to maintain good health. Everyone needs to write their senator, urging him to vote yes on this bill.